The ever popular art glass sun-catchers are always a hit with kids. I cut the art glass into small pieces ahead of time and then give each kid a piece of clear base glass. The great thing about this type of project is you can often get color scrap glass from other glass artists at little or no cost (make sure you get the same CoE). If you can get the scrap donated, in my experience the cost for the clear glass is about $2-$3 per student for a 4″ x 4″ sun-catcher. Most schools or parent organizations can and are quite happy to pay for this activity. This one is a little bit more difficult because the kids are not actually working on glass, so it can be a bit of a leap for them. However, if you have good examples, you can explain the process and then it’s off to the races. Kids love to play with clay. Prepare all of the clay slabs ahead of time and have a variety of interesting things to press into the clay. Consider taking a nature walk with the kids before starting to collect things to make texture with. Another great candidate for a nature walk, and, consider using dirt/soil from the school grounds, maybe even having the kids dig it up and filter it. This project uses a lot of float glass, so if you have a good relationship with your local window replacement company, this is where to use up that glass. Make sure you keep the glass from each pane separate, the last thing you want is a kid project with compatibility issues! 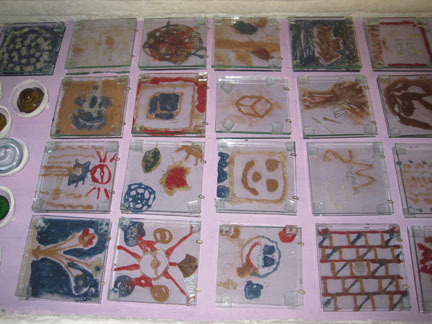 I cut all of the glass ahead of time, and then give each kid 2 6″ x 6″ pieces of glass and four small squares. The kids add dirt and leaves (and colored float fire frit, if you want to get that involved). 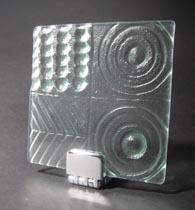 The corners are glued onto the bottom piece of glass and then the top piece is added to make a glass “sandwich”. The projects are then transported back to the studio for firing. invest in a bunch (6-10) of fine point silver paint markers and have kids write their name on the back of their projects. This is a huge timesaver. Have volunteers in the classroom. I invite parents to participate and always have the teacher do the project too. For younger children (K-3rd grade) one adult for every 5-6 students will keep things on track. Don’t count yourself, you won’t have time to sit at a table with a group! Pack a first aid kit. Someone will need a band-aid, usually it’s me, but you don’t want to bleed all over the kids or the classroom. Heavy weight paper plates are your friend. It’s much easier to keep kid projects contained if they are on a plate, and, emphasize that the glass stays on the plate, especially while walking around. I did this project with my girl scout troop years ago.. 4×4 squares of clear and lots of pre-cut pieces of color… they loved it!! !